There's a reason Trader Joe's has become America's favorite grocery store, and it has nothing to do with those Hawaiian shirts. The store has come a long way since opening in Pasadena, California back in 1967, growing to an empire and drawing hordes of shoppers on the strength of its affordable, store-brand offerings, which rotate often and include everything from coffee and booze to healthy meals, unexpected snacks, incredible cheese, and internationally focused entrees that have helped evolve the American palate. It has legions of devoted fans. Even haters can't help but find something to love within its aisles. But some items are just better, more impactful, than others. 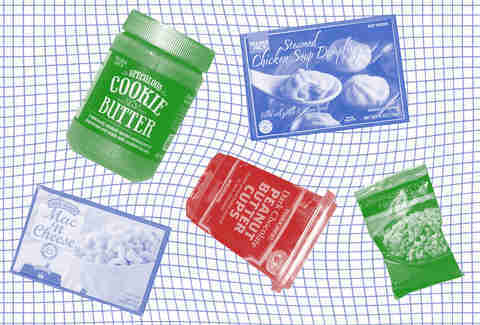 To celebrate all things TJ's, we sat down, compared shopping lists, argued, and arrived at these 50 essential items that truly belong in your shopping cart. Here, you'll find game-changing icons, beloved seasonal releases, and simple innovations that helped TJ's change the way we shop. Add them to your own list, then head down to the comments and tell us what should be on ours. Maybe ring a nautical bell down there... we're pretty sure that somebody needs help at check stand 2. “I love eating cookies, but I sure wish I could turn them into a spread,” is apparently what all America was secretly thinking before Trader Joe’s took Belgium’s famed Speculoos biscuits and reimagined them in spreadable form. Cookie Butter became a near-instant icon as the chain grew in status and popularity, with supplies selling out at some stores. It took on a life of its own on social media, and in 2016, it was declared Trader Joe's most popular item. Cookie Butter fever has since cooled, but it remains a strong contender for the most versatile dessert on shelves. Like another of America’s favorite dessert spreads -- Nutella -- it’s perfect for dipping pretzels into, spreading on bread to make a sweet ‘wich, and topping waffles, pancakes, and ice cream. But whereas Nutella is a UFC fighter punishing your tastebuds with hazelnut and cocoa until you submit, Cookie Butter is a librarian, tucking your taste buds into bed with a cup of tea and a buttery shortbread cookie. It was an innovation that eventually, blissfully, became part of many shoppers weekly lists. No, we're not talking about TJ's regular and gluten-free boxed mac. The Diner Mac is a beast all its own, an unconscionably salty and fatty blast of comfort that stands tall next to the likes of Stouffer's or, dare we say, your grandmas. After five minutes spinning in the microwave, it will emerge basically on fire, and you have to wait at least a minute or two for it to cool down or you’ll be driving yourself to the ER with burns from the gooey blend of Cheddar, Swiss, Havarti and Gouda. Once it’s cooled down and is only semi-scalding, every single forkful is a step toward a better day. 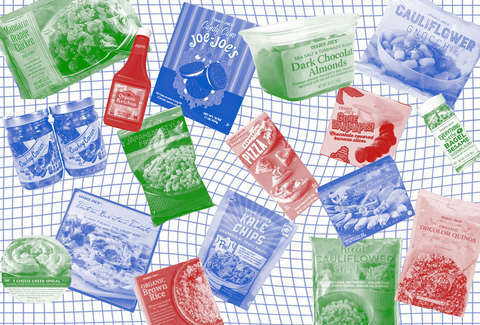 This snack encapsulates exactly why Trader Joe’s sells so much junk food. First: these peanut butter cups are tiny and you buy ‘em in a huge plastic bin. Eating a few of them puts absolutely no dent in the larger bucket. So what’s the big deal about eating a few? It’s almost healthy, you know? Dark chocolate? Healthy. Peanut butter? Healthy. Consuming snacks in moderation? Healthy. Now, in reality, you’re probably eating five or six at a time of these absolutely addictive mini Reese’s-for-grownups. TJ’s says there are 36 cups per tub, which means you can eat five a day and the tub will last a week. Perfectly reasonable. It’s almost like you didn’t eat any of them at all. Who knew that Trader Joe’s, of all places, would be the ones to crack the code of the frozen soup dumpling? And why hasn’t Din Tai Fung rolled out these bad boys yet? These are definitely reminiscent of your favorite xiaolongbao spots, with a delightful burst of soup packed into each little dumpling. They're made from chicken instead of the traditional pork, but packed with ginger and onion so it’s hard to notice a stark difference. The dumpling skins aren’t as thin and delicate as you’d expect, but come on, it’s a microwaveable soup dumpling from a major grocery chain that actually tastes good. The worst part is that there are only six to a box, and anyone who eats soup dumplings knows you need at least three trays of those bad boys. Another gem from Joe's apparent travels to the East, this is perhaps the most satisfyingly simple of all the pan-Asian fare in the freezer. The lightly oiled rice is packed with edamame (just the beans, no pod weirdo), julienned carrots, protein-packing tofu, and, most crucially, hijiki seaweed, which adds a completely different profile to what many associate with garden-variety takeout fried rice. It's layered. It's thoughtfully composed. Balanced. Dare we say it's almost restaurant quality? We won't say. It's rude to talk with your mouth full of seaweed strands. Two-Buck Chuck might have become Three-Buck Chuck since debuting in 2002, but the fact remains that the chain offers up perfectly drinkable wine for less than the price of bottled water. The line has become the stuff of legend, raising the profile of cheap wine and making the idea of a low-budget wine party even more feasible than a kegger for cash-strapped folks who want to pop some corks without being snooty. It has done more to generate the taste for good(ish) wine than any other budget bottle. It's got an interesting history that you can read all about right here... preferably by candlelight with a nice bottle of red. Quinoa is high in fiber and protein, offers more flavor than plain white rice, and is a great side dish with any meat, fish or veggie. Yet for many Americans, it was abstract, a product you could only dig out of a bulk crate in a food co-op in the minds of many Americans. Then Trader Joe's came along and suddenly, your uncle in Iowa was all about it, which is great. It’s organic! It’s colorful -- white, red, and black! You can cook it in an Instant Pot in 11 minutes! You can even prepare this while a TJ’s frozen dinner is cooking in the oven or microwave. It’s more than a seed that acts like a grain, it can change your life. You thought you were a lazy bum, but then you buy this bag. All of a sudden you’re the type of person who eats quinoa, who hikes on the weekends, who goes to SoulCycle. No, this isn't on par with anything you'll get at a good Indian restaurant. It's probably more on par with the type of thing you'd get at a late-night window in London. But it's still pretty damn good. And the fact that the Chicken Tikka Masala -- along with butter chicken and more than a dozen other Indian offerings -- is so prominent in the freezer just goes to show that, when given the option, Americans crave more than pizza and TV dinners when it comes to the grocer's freezer. Pizza dough is actually remarkably easy to make. But it's time-consuming. And it can leave your kitchen coated in flour. These days, many grocery chains will offer up a ball of pre-made dough. When TJ's first did it, it was a game changer, a way for lazy home cooks to create pizzas, breadsticks, rolls, pockets, and everything in between while passing them off as their own. The chain has made a cottage industry out of offering things that people can pass off as homemade. The dough, though, lets you have your chef-inspired whims, your sense of self-satisfaction at a dinner party, and your clean kitchen at the same time. The name may give you a little caution: Honestly, generally when you find something unexpected in your food, it's cause for alarm. But this is not the equivalent of finding a hubcap in your bouillabaisse. It's basically the Cookie Butter of the dairy section, a block of sharp white Cheddar with salty, often crystalized little chunks of Parmesan hidden within, adding a nice little bite to an otherwise still-great block of cheese. It might be the crown jewel of the TJ's cheese spread. When it comes to Unexpected Cheddar, expect to eat a whole block in one sitting. Some things in life just go together. Peanut butter and jelly, sour cream and onions, cookies and milk, and yes, chocolate and nuts. More specifically, almonds. Trader Joe’s whips up a delicious and luxurious treat with their Sea Salt & Turbinado Sugar Dark Chocolate Almonds (that name just rolls off the tongue!). Their almonds are coated in a generous layer of rich, dark chocolate, and then sprinkled with sea salt and raw sugar for a textural flavor explosion. The sea salt enhances the flavor of the chocolate while the turbinado sugar gives a complex sweetness that balances the whole thing. It’s everything you would want in a treat: nutty, crunchy, sweet, and a little salty. Buy two -- or three -- packages of these almonds; you’ll be shoveling them down by the handful. At some point in the modern era, if people wanted a quick, salty snack full of protein, they were forced to dip pretzels into jars of peanut butter. Oh, the horror! Trader Joe’s has made it so that you have no need to perform that type of hard labor. 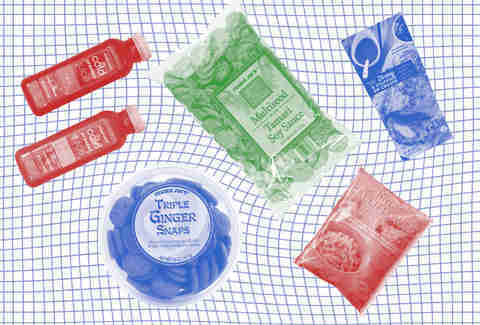 Other brands carry a similar snack, but as it is with much of TJ’s food, the ingredients are often recognizable and minimal. These thicc (yeah, we said thicc!) pretzels filled with primo, creamy peanut butter are no exception, as it contains no preservatives, artificial colors or flavors. Whether you enjoy the pretzels as part of a trail mix, or just to eat handful after handful at your desk as you wait for lunch to roll around, Peanut Butter Filled Pretzels are one of the simplest, most satisfying snacks. Like an inflated, peanut butter-flavored Cheeto so addictive that it makes one bag seem like a reasonable serving size, Bamba hit TJ’s shelves in 2017 to rave reviews. The snack food staple that has dominated Israel for decades was introduced to a wide American audience, and the states couldn’t get enough. Despite the peanut shape and flavor, Bamba are actually baked corn grits that’ve been slathered in peanut butter. And each bag is only $.99, giving you a solid snacking option when you’re sick of eating bland potato chips. When this originally debuted in TJ’s refrigerated section in summer 2018, anyone looking at the price might have assumed it was a mistake. $1.99 for organic cold brew?! And it’s nitro?! Uh, those people were right -- that price didn’t last long. But paying anything under $3 for organic coffee that comes out this creamy and delicious is a miracle. Don’t you dare drink this from the bottle, unless you want to pour the nitrogen-infused cold brew directly into your stomach. Instead, pour it into a glass and watch the nitro java cascade almost exactly like a Guinness. Enjoy your caffeine-fueled buzz provided by the organic espresso. You’ll never want to go back to ordinary cold brew again. Don’t be put off by its weird name. TJ’s Cowboy Caviar is everything you want out of a salsa: chunky, spicy, and good on tortilla chips or mashed up with an avocado. It’s a medley of corn, beans, onions, and peppers, stewed up in a chipotle, adobo, and lime sauce. It contains no cowboy or fish eggs, but it will still make you say "yeehaw" (maybe) and eat four times the daily allotment of tortilla chips due to how addicting it is (definitely). Trader Joe's beer game has always been impressive in both its breadth and quality, but the Vintage Ale that they release each year is particularly sought after: a rich, strong Belgian ale that could comfortably hang out in any beer geeks cellar, evolving over time alongside beers that cost four times its $5.99 price tag. Of course, if you can't wait to open it, enjoying it straight after you hit the store won't leave you disappointed, either. The adorably miniature size of the Hold the Cone series of tiny ice cream novelties is a bit of a mixed blessing -- on the one hand, it's quite appealing as a minimalist after-dinner treat, giving you a downsized version of the glorious experience that is ordering yourself a Drumstick right off the ice cream truck, right down to the chocolatey end of the cone, which we all know is the best part. The downside is, their snacky size makes it rather easy to talk yourself into polishing off an entire box. Well, is that REALLY a downside? Yeah, the rebranding of TJ's Chinese-ish entrees as Trader Ming's is more than a little twee. But we're willing to forgive semantics, especially given how meaty this take on sweet/sour orange chicken really is, especially when paired up with some frozen brown rice. Even better, it saves you a trip to Panda Express. Or the embarrassment of freezing leftover Panda to heat up later. You’ve got to hand it to Trader Joe’s: they really do have a grasp on their Mexican fare. TJ’s marinated, uncooked carne asada is perfect for your Taco Tuesday or Fajita Friday or whatever alliteration you’re most feeling to decide what you have for dinner. The steak is tender and well-seasoned, easy to sear, and retains its juiciness. It comes as a whole steak, so it’s up to you whether you want to chop it up into cubes, strips, or leave it whole -- which is honestly better than having it precut so the meat doesn’t dry out when you cook it. Put this in a tortilla, over rice, or just in your mouth. For those without access to a carniceria, there's nothing quite like it on the grocery circuit. And lo, Trader Joe's unleashed a healthier, organic alternative to Heinz, much to the joy of people who love French fries and hot-dog heretics alike. Naysayers often point out that Trader Joe's loyalists automatically assume their products are healthy and organic by nature of being in the store. They're not. But when TJ's goes for it, they go all in, and out comes something undeniably delicious, versatile, and able to disrupt long-held beliefs about legacy condiments. In many kitchens, this variation is quickly erasing the number 57. What’s the fastest growing pizza brand in America? 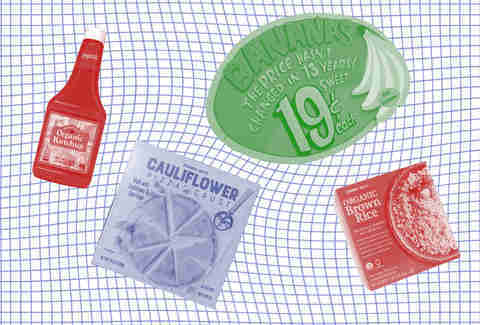 If you guessed Caulipower -- which makes cauliflower crust and has sold over 10 million pizzas -- you’re right! TJ’s knows when to capitalize on a trend, having already given you as much riced cauliflower and cauliflower gnocchi as you can handle. Keep in mind, this product is crust only -- you’ve gotta provide your own sauce, veggies, and meats, though that’s a simple task when you’re already at TJ’s. Some critics say the crust isn’t as crispy as regular pizza dough. Those people are right. But look at this miraculous frozen food from a nutritional perspective: one serving is gluten-free, dairy-free, egg-free, has zero grams of fat, and 80 calories. But will you top the crust with a pound of pepperoni, a gallon of marinara sauce, and a block of cheese as big as your left leg? Absolutely. And yet, this is gluten-free manna from heaven for those who don’t consume traditional pizza for dietary reasons. In 2019, you can have your pizza and eat it too. One of TJ's most iconic moves is selling individual bananas underneath a sign reading "the price hasn't changed in 13 years." On a recent episode of the Inside Trader Joe's podcast, CEO Dan Bane spun an adorable little anecdote, saying the idea came from an elderly woman who said she didn't buy bunches of bananas because "Sonny, I may not live to that fourth banana." It's really cute and heartwarming. But here's the thing. At most grocery stores you can just rip off an individual banana and buy it at the per-pound price anyway. The average cost of a pound of bananas is about $.60... or just a little more than $.19 a banana. The price was cheaper 13 years ago, making the TJ's bananas slightly more expensive back in the day. TJ's bananas stayed the same price as inflation caught up to them. Maybe in 10 years, it will be the great deal it's perceived as. For now, it's just an ingenious bit of marketing, a single-serving fruit being sold at market price, but seemingly at a discount. Sometimes, less is literally more. Remember 2007? Before Instagram was a thing, before Ron Artest was Metta World Peace, and before your phone enabled you to tap a button and summon a stranger to drive you around. It was also when people waited 50 minutes for brown rice to cook on their stovetops. Who the hell had time for that? Then TJ’s came through and gave you two packets of single-serving frozen organic brown rice that could be heated up in three minutes in the microwave. It was a perfect base for any type of meal, whether you wanted to pair it with TJ’s Mandarin Orange Chicken or some tofu. For a brand that gives you plenty of ways to binge junk food, it’s nice that it also offers an easy way to eat healthy. Nuts can be expensive. In the greater scheme of Trader Joe's, $8 for a bag of something is a lot… but it's cheap as hell for cashews. And these are not the cashews you were expecting. They're enormous. They're salty as hell. But they're also versatile. They come lightly salted or with no salt at all. You can save a couple bucks by getting them in pieces rather as whole crescent-shaped beasts. They're the king of TJ's prolific nut section, which also includes shelled pistachios, another innovation that puts this protein section on point. Still, those cashews -- whole or shattered into pieces -- represent a huge win for bargain hunters, offered at bulk-bin prices without the added worry of contracting some bacterial infection because some cheapskate was grazing on them earlier. This dessert is miraculous for a few reasons. First: it’s non-dairy. Sure, there are non-dairy mochi in your supermarket’s freezer, too. But the Thai Tea mochi contains a glorious, coconut-based, ice cream-ish filling that won’t make you miss condensed milk, and the Mango Mini Mochi has a delightful mango sorbet for as much real mango flavor as fits into a tiny package. And let’s not forget the size of these suckers: they are mini. Just like Oreo Mini are preferable to the age-old Oreo, these Mini Mochi are improvements on the original. This small size allows you to stuff your face with more of these than you could with any regular-sized Green Tea Mochi, and you can still feel relatively good about your snack food choices -- the serving size is six! And there’s no waiting to eat those six either: they melt rapidly, and thus you must eat them quickly as well. 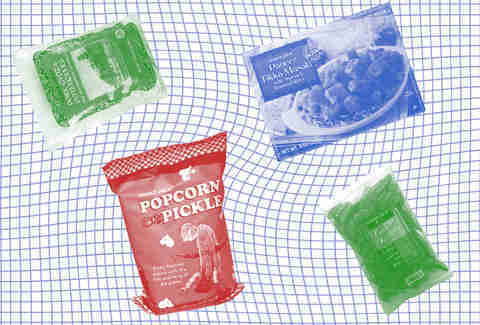 TJ’s has long had an exceptional selection of microwaveable Indian dishes in the freezer section. But to truly level-up any of these dishes into a full-fledged meals, you need naan. While the Tandoori Naan is perfectly fine, the copious amounts of garlic and cilantro atop this naan give this legendary status. The company suggests you heat it in the oven for two minutes, but even a quick blast of heat from the toaster oven will turn this into arguably the best part of any Indian meal from the freezer section. And if you’re feeling particularly creative, slap veggies and meats on top of the naan to concoct your own take on Indian pizza. This should actually be a bad thing. Mini tacos? Why do we need to make tacos even smaller -- they’re already small! But damned if these aren’t one of the most delicious, drunchy food ever. They’re like taquitos, but cuter and flatter. They come in both a chicken and beef variety. They’re here for you when you stumble home and need something greasy to complete your night. They’re also here for you if you haven’t left your house in two days, are wearing the same sweatpants, and can’t be bothered to cook something that isn’t pre-packaged and frozen. Whatever the case, microwave them or pan fry them in hot oil and indulge. Throw some TJ’s Cowboy Caviar on them if you’re feeling extra saucy. Trader Joe’s has tartes galore. There’s savory and sweet ones, cheesy and fruity, but most of all, TJ’s tartes are buttery and easy-to-prepare. If you ever want to make any sort of meal instantly better, fill it in a flaky, crusty shell. Trader Joe’s knows this, and has arguably mastered this. One of the highlights of TJ’s tartes is their Tarte au Brie et aux Tomates which TJ’s describes as “very French” on the packaging. It’s full of gooey brie cheese and cherry red tomatoes layered on a creamy base of crème fraîche. Feel free to heat this tarte up in your oven, pour yourself a glass of ($3) wine, and pretend you’re on the coast of France. It’s a medallion of goat cheese. Need we say more? This is like the gold medal if you were competing in the Trader Joe’s cheese-eating olympics. It’s got the tang of goat cheese you know and love molded into a perfect cylinder of stinky, cheesy perfection. Throw this in your salad, your mashed potatoes, your mouth -- we’re not judging. They're essential elements of a TJ's cheese plate, and instantly class things up at minimal cost and minimal frustration with cutting a log of soft cheese. Gyoza are the most versatile dumpling. They’re yummy steamed, pan fried, deep fried, boiled, microwaved. That's the power of an herbaceous meatball wrapped in a dough skin that’s easy to cook and delicious. TJ’s redundantly named gyoza potstickers come in pork and chicken options, as well as shrimp and veggie if you venture into the frozen Thai section (which is funny, because Thai people don’t traditionally have "gyozas," but that’s an entirely different conversation). The cool part about these frozen friends are that the ingredients are actually identifiable: you’ll find a meat filling made with the protein of your choice, as well as ginger, green onion, garlic, and soy sauce (all common ingredients for traditional dumplings). Drown these dumplings in some soy sauce and vinegar and you can pretend you’re at your favorite ethnically ambiguous dumpling spot. America loves food that tastes like other food. One example: Oreo recently released a cookie that tastes like carrot cake! Ok, two examples: ranch dressing tastes like pizza now. Trader Joe’s has never been shy to jump on any food trend’s bandwagon. That’s how we ended up with Birthday Cake popped corn -- a steal for $1.99 -- which has been a smash hit since its release in mid-2018; Peppermint Bark and Candy Corn also debuted that year. 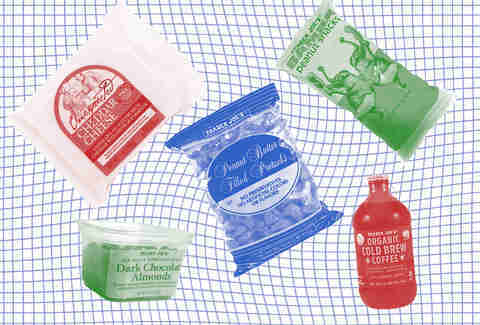 All of these flavors helped put a new twist on a snack that seemingly hasn’t changed much in years. For those without a sweet tooth but are sick of the classic olive oil flavor, there's even pickle popcorn. Can Cookie Dough Popcorn be far behind? Probably not as far as you think. Another one of the stars among Trader Joe’s Indian food is their paneer tikka masala complete with spinach rice. It’s a microwaveable meal that smells intoxicatingly good and is full of squeaky cubes of paneer. The spinach rice complements the curry perfectly and the meal as a whole is reminiscent of good, takeout Indian food. Bonus: it’s vegetarian! If you eat in restaurants on a regular basis, you've likely encountered a crushed candied pecan or two hanging out in the salad section of the menu, providing its signature blend of salt, sweetness, and crunch to amplify your salad eating experience. Trader Joe's version handles this task admirably, at a price point ($3.99 for 5 ounces) decidedly lower than the sometimes unconscionable prices you'll see for these little beauties at other grocers. This feature will make you feel less guilty about eating half the bag before it can make its way into your salad. While the Zesty Nacho version appears to have disappeared from shelves (pray they come back, and until then, check out Rhythm Superfoods), TJ's is still in the game with Seasoned Kale Chips dressed with cashew butter and tahini. Here’s the real shocker: even if you’re not looking to eat healthy, it’s still a solid snack. Don’t get us wrong, it tastes like it’s good for you -- it’s not tricking anyone into thinking it’s a tortilla chip. But for the savory snack lover, you could do a lot worse than munching on these “air crisped” chips. The strong tahini flavors along with the background carrot and onion notes (thankfully) overshadow the kale’s natural bitterness. Even better, if you push a shopping cart out of Trader Joe’s filled with Cookie Butter, Mac and Cheese Bites, six tubs of Dark Chocolate Peanut Butter Cups, and these kale chips, you can convince yourself that you bought healthy groceries. They say miracles happen every day, and that is never more true than when you prepare a cauliflower gnocchi that pretty much tastes like regular gnocchi. It’s a mystery how TJ’s was able to find a gnocchi-maker that crafted these mini-pillows from 75% cauliflower, yet they taste almost exactly as starchy and delicious as those made from potato and eggs...once you toss them in pasta sauce and veggies. But you weren’t going to eat them plain anyways because you’re not a monster. Trust us, you won’t miss the real thing one bit. Even better, if you’re super lazy and don’t want to wait for them to boil or saute on the stove, you can microwave ‘em and be eating in about five minutes. For anyone who feels like they swallowed a 5-pound barbell covered in grease after eating one of those individual-sized pies from the freezer section, Bambino Pizza is your new favorite dinner. One of these tiny, pizza-bagel-sized pies along with a side dish or two should provide the pizza fix you crave without the bloat afterwards. And don’t be fooled by its size, this has everything you want in a pie: crispy dough, a flavorful red sauce, and a cheesy layer of mozzarella, provolone, parmesan, and romano. Most importantly, it only takes 10 minutes in the oven. If Babe Ruth hadn’t already been dead for 61 years, he might have loved these tiny pizzas, if only because of the name. And then he’d probably sue Trader Joe's -- sorry, it says Trader Giotto's on the package -- for using him to sell pizza. It's no Sabra, but Trader Joe's hummus game is completely on point, with a variety of flavors ranging from sriracha to edamame. Still, the smooth, robust original Mediterranean variety It's deceptively simple, with a little pine nut garnish to add texture and little more to amp up the garbanzo flavor. This is a gateway hummus, one that elevates pretty much every non-flavored tortilla, cracker, pita, or chip at TJ's. Williams-Sonoma has its comically overpriced but addictive peppermint bark, and Trader Joe's has Candy Cane Joe-Joe's, a seasonal take on their ubiquitous, Oreo-esque line of cookies. They taste like a Buddy the Elf fever dream, in the best possible way. And for those of you who feel like a sandwich cookie filled with candy cane cream seems just a touch restrained, rest easy knowing that they also offer a chocolate-covered version. Yes, we're here to praise the virtues of the Southwest Salad. It's low-calorie and loaded with lettuce, cabbage, peppers, black beans, corn, cojita, and a creamy yogurt ranch. It's incredible. But this is also about the arsenal of grab-and-go salads in Trader Joe's formidable fridge, which put most stores' offerings of ranch-drenched lettuce to shame. There's really something for every taste, provided your taste isn't boring. There's a Thai-style number with daikon radish and chicken. A Mexicali with seasoned chicken, pepitas, and sun-dried tomatoes. Caprese salad complete with fresh mozz. A spicy, healthy take on southern slaw packed with kale and broccoli. And yes, if there's a classic Greek. It's basically a salad bar, without the need to actually make a salad, one where your options are on par with a fancy salad restaurant's. TJ’s cold pressed juice will give any of LA’s hipster juice offerings -- the ones that cost $13 and your first born child per bottle -- a run for their money. It’s pure fruit and veggies that undergo a “high pressure processing (HPP) process,” whatever the hell that means (it means the the freshness of the juice is maintained without heat or added preservatives). Either way, it’s fresh juice, made from whole fruits and veggies, that have a shelf life of 30 days -- much longer than other cold pressed juices. And at $3.99 a bottle, you even get to keep your first born. Win-win-win! If you're one of those people who casually dismisses the ginger snap as something grandpas eat, you're missing out, especially when it comes to Trader Joe's version. The "triple ginger" isn't just some marketing ploy: These cookies legit deploy three types of ginger (fresh, crystallized, ground) for a spicy kick that other mass market versions fail to replicate. They're delightful on their own, fantastic dipped in the autumnal beverage of your choosing (or just, you know, milk), and even do a fine job of helping you make a next-level pie crust. You know those cute, crispy, salty, airy, shiny little cheese crackers that are frequently placed on cheese plates to scoop up soft cheeses, but often get eaten on their own because they're incredible on their own? These are those. But better. Because they're kissed with extra salt courtesy of soy sauce and tamari, and maybe a little healthier because they have seed element. They come in a giant bag. We're sure they're intended to be eaten with goat cheese or Gournay. We're not sure. We ate them all before we could get the plate assembled. But we're sure they're great with accoutrements. "En croute" is just a fancypants French way of saying "lovingly wrapped in buttery flaky pastry" and serving this beauty at your Thanksgiving is an American way of saying "look, doing a full-on raw bird is above my paygrade, but I didn't want to just order takeout so here we are, okay?". In all seriousness, this lovely amalgam of turkey tenderloin, cornbread stuffing, and puff pastry can serve as the centerpiece for a respectable Thanksgiving dinner for less than $15 (gravy included), which is no small feat, especially for those who are either lacking confidence or just plain lazy where the kitchen is concerned. Sometimes vegetarians must walk down the frozen food aisle at Trader Joe’s and get depressed. “Oh cool, a new pot pie made with wildebeest dark meat,” they think. But other times, like back in August 2017 when this stir fry debuted, it must seem like a beautiful oasis in a sea of animal parts. This doesn’t just check boxes for vegetarians: it’s also grain-free for those low-carb folks. Mostly it’s a perfect start to dinner: it’s a base of cauliflower, green peas, red peppers, corn, and spring onions doused with a delicious tamari. Pair this with chicken strips? Perfect. How about TJ’s Sriracha Baked Tofu? Of course. Eat it as a side dish? Yessir. This stir fry is an edible Rorschach -- it can turn into whatever you want it to be. Whoop-de-do, it’s a box of frozen banana slices covered in dark chocolate. Accordingly, the ingredients in said box are “banana, chocolate.” But despite its simplicity, it manages to be both deliciously satisfying and healthy-ish -- 12 grams sugar per four pieces. Perhaps more importantly to people with taste buds and a sweet tooth, those lone ingredients pack a ton of flavor. Bite into the thick coating of dark chocolate around the perfectly ripened banana slices and you’ll understand. TJ’s New York Deli-Style Baked Cheesecake and Mini Mochi might get all the buzz in the freezer section, but the company says those simple chocolate-covered bananas are one of its top-selling frozen desserts of all time. There really is always money in the banana stand. The best part of mac & cheese is the layer of crispy breadcrumbs on top. It’s not just the breadcrumbs, obviously -- it’s when the cheesy macaroni and the breadcrumbs combine for a perfect, decadent bite. But then you finish those breadcrumbs, and you’re left with just plain mac. Not good enough, dammit! These circular, magical Bites make sure that every bite you take has that critical layer of breadcrumbs. It shouldn’t be possible for something this hot and delicious to only take about 15 minutes to get from the freezer to the oven to your mouth. Even better, they’re called Bites, but they’re not bite-sized. It takes a few bites to finish ‘em, ensuring that it’ll satisfy your much-needed fix of macaroni and cheese over and over again. One of the more peculiar things about the TJ’s mindset is the misconception that everything the brand sells is healthy. The Steak & Ale pie is a glorious rejoinder. Modeled after the squat, protein-overloaded pies you’d get at a proper British pub -- the ones that look like hyper-steroidal, pastry-wrapped hockey pucks that wandered off the set of Sweeney Todd -- these suckers pack about 800 calories into something the size of a fist, which is no small feat. Neither is the fact that they’re absolute bangers, loaded with about a steak’s worth of meat soaked in a tangy, beer-based gravy and crammed into a vessel that might as well be made of pure butter. They’re like a pot pie’s cockney brother, and they’re the most deadly delicious combination of ingredients and saturated fat in the Joe’s arsenal. Fact: crinkle-cutting anything makes it better. Joe's takes the philosophy of diner French fries and applies it to these buckets of butternut squash. Other fact: butternut squash is equally healthy and off-putting to picky eaters. This basically tricks them. Bake them. Throw them in a salad. Or air-fry them to create a French fry substitute: Still healthy, yet perfectly at home with diner fair like TJ's mac & cheese. Such is the power of the crinkle-cut. Lee Breslouer, Andy Kryza, Matt Lynch, Khushbu Shah, and Kat Thompson scoured their shopping lists for this article.